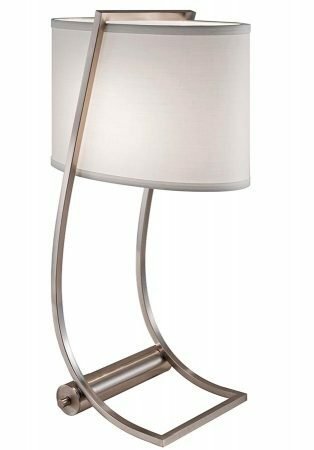 This Feiss Lex brushed steel finish table lamp with white shade and USB charging port is contemporary, practical and luxurious. Featuring a curved cradle frame and rear cylindrical base, with an oval hard backed true white cotton lamp shade supported in the cradle. The USB Port is contained within the base and is a convenient way to charge your smart phone, tablet or other mobile device without a separate cable. This is an on-trend table lamp, with a curved open frame that gives it a three-dimensional feel. The subtle brushed steel finish and pure white oval shade combine to produce a luxurious combination of space and depth. A bright table lamp that is perfect for use on a sideboard, console or bedside table in your living room, dining room or bedroom. This table light is supplied by Elstead Lighting and designed in the USA by Feiss, founded in New York in 1955. They have become well known over the years for their contemporary yet classic styling, quality and great original designs like the Lex brushed steel finish table lamp with white shade and USB charging port you see here.